Maps have served as inspiration for travelers and artists alike. Maps need not show only continents and oceans: there are maps of the world before it was known and maps to secret places only known to the mapmaker. Artists' maps show another kind of uncharted realm: the imagination. In this one day workshop we will dive into the rich subject of map making as a source of inspiration. We will look at the wide variety of approaches and media historians and artists have taken to mapping and create our own artwork. Each student will work from their own simple still life in this oil painting class. Focusing on color, value and form, we will explore the alla prima ("all-in-one-session") method. Brushes, mediums, and materials will be discussed as we examine this classic subject. 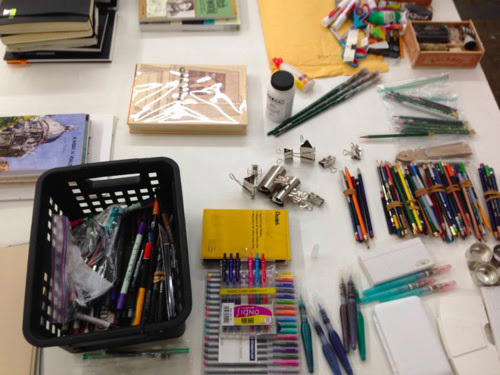 In this workshop we will explore a multitude sketching materials. Students will learn about and have access to a variety of materials with which to experiment in their sketchbooks, including water-soluble materials, permanent inks, and watercolors.